Despite topping the Central Division standings, the Winnipeg Jets are unraveling at the worst possible moment. The team is 2-5-0 in its past seven contests with Nashville and St. Louis breathing down its neck. Over the next few days, the Jets’ conference quarterfinals outlook could go from hosting a wild card to starting the playoffs on the road. That’s how tight this race is and how crucial it is for them to get back on track. Unfortunately, this can’t be dismissed as a one-off slide because the club hasn’t performed well in over a month. The players are seemingly just waiting for someone else to get the job done. Flipping the switch, which the vast majority of teams aren’t capable of, becomes considerably harder if you’ve developed bad habits down the stretch. Since the trade deadline in late February, Winnipeg is 9-9-0 and controlling 45.4% of the shot attempts (28th), 46.1% of the scoring chances (24th) and 44.3% of the high-danger bids (27th) at 5-on-5. Those are numbers you’d expect from a bottom-feeder — not a contender. Sure, the Jets remain potent and have scored 3.11 goals per game over that span, but they’ve conceded an average of 3.00. That figure would be even higher if not for the fifth-highest PDO (102.0) in the league. Puck luck has saved them from serious trouble. The curious part of this rough patch is how starkly it contrasts with last year’s Jets. Following the 2017-18 trade deadline, Winnipeg posted a 52.5 CF% (6th), 52.4 SCF% (9th) and 50.1 HDCF% (16th). It looked like a fiercely competitive and confident squad, and it rode that wave of momentum all the way to the third round. The belief and enthusiasm are nowhere to be found at present. 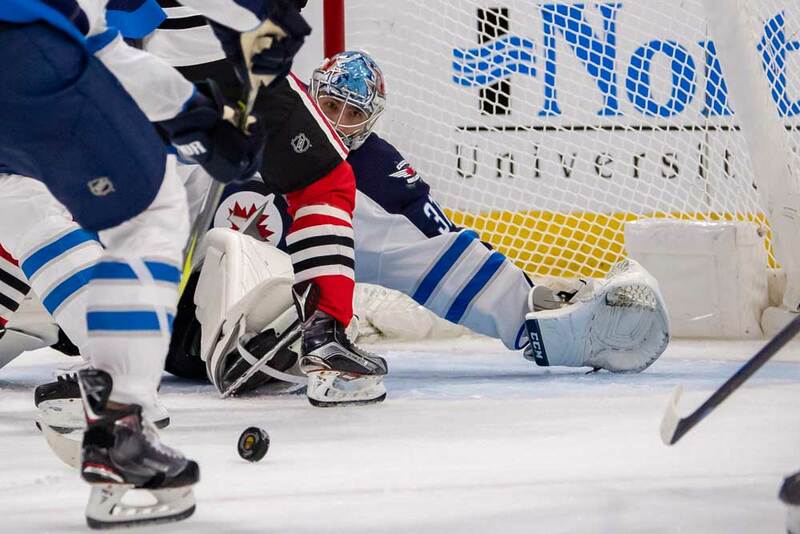 Starting goaltender Connor Hellebuyck (2.91 GAA, 91.3 SV%) has turned his year around following a difficult start…but that hasn’t mattered in the slightest. He’s registered a solid 92.4 SV% since the trade deadline, yet the club has gone .500 in his appearances. Josh Morrissey’s upper-body injury (out since Feb. 24) could explain a portion of the defensive issues. At age 24, he’s already matured into the club’s most dependable blueliner. He’s rock solid in coverage and uses his stick well to disrupt the opposition. In addition, he doesn’t panic with the puck and moves it well to allow the forwards to initiate the attack. However, he’s still played 59 games this year and Winnipeg has looked off for more than a few of them. Something’s not quite right with the Jets, and it starts right at the top. Though center Mark Scheifele (81 points in 79 games) and winger Blake Wheeler (89 points in 79 games) are talented and productive first-line forwards, their lackluster play of late has reflected the team’s. Scheifele is displaying no assertiveness whatsoever and losing far too many puck battles. Meanwhile, the captain has long been wildly inconsistent. When Wheeler is off his game, he skates in circles and turns pucks over like nobody’s business. Dating back to late February, they’ve combined for a 42.1 CF%, 44.0 SCF%, 39.8 HDCF% and 47.4 GF%. Prior to that, they had delivered a much more respectable 50.7 CF%, 48.9 SCF%, 46.7 HDCF% and 51.2 GF%. Scheifele and Wheeler are simply too good to be performing this poorly. Above all else, it’s up to these two to find their footing and spark a reversal of fortune for the entire team. As recently as last season, they showed the tools and ability to play smart, winning hockey. When your leaders don’t set the tone — or at least not the right one — the rest of the troops rarely fare well on their own. Patrik Laine (50 points in 79 games) remains mired in a horrific season. While he’s produced decently on the strength of pure talent, his overall impact has been awful. He isn’t generating much with the puck and is a total non-factor without it. Since the trade deadline, he ranks dead last among Jets forwards in CF% (41.2), SCF% (40.3) and HDCF% (35.5). Those are unacceptable marks across the board. Speed demon Nikolaj Ehlers (35 points in 59 games) returned from injury just as the ship began to sink, so it’s no surprise that he’s offered up just eight points in his last 18 outings either. In addition, head coach Paul Maurice’s decision to play center Bryan Little (41 points in 79 games) on the wing has nullified any of the positive traits he brings to the table. The veteran has a mere two points since the trade deadline and can’t seem to contribute from the flank. With his 6’5”, 210-pound frame and motor, Adam Lowry (22 points in 75 games) is likely better suited to the wing than Little, so Maurice should consider running Scheifele, Kevin Hayes, Little and Andrew Copp as the four pivots. The problems extend to the blue line as well. Dustin Byfuglien (30 points in 40 games) has only played in three contests since recovering from an ankle injury and doesn’t appear ready to leave his mark yet. Jacob Trouba isn’t as effective without his full-time partner Morrissey, whereas Dmitry Kulikov (44.7 CF%, 42.9 SCF%, 40.2 HDCF% since trade deadline) and Tyler Myers (45.0 CF%, 42.3 SCF%, 41.6 HDCF%) don’t govern enough of the action. Until Morrissey returns, though, Maurice only has so many options. Defensemen are out of their depth and playing in roles that don’t suit them. For instance, young puck-mover Sami Niku is getting absolutely pounded in shot and chance shares (44.0 CF%, 43.9 SCF%, 38.6 HDCF%) down the stretch. Considering the team’s lack of control at the point of attack, it’s no surprise that the Jets are struggling in crunch time. They appear incapable of locking things down or stopping the bleeding. Furthermore, they keep doing the same thing over and over again. From the bench boss down the lineup, they’re at a loss for how to break out of this slump — and it’s leading to more losses. Outside of Copp and Brandon Tanev, the Jets that relished the prospect of going toe to toe with the other team and imposing their will…they’re long gone. The current Jets are unrecognizable, scattered and veering off the rails just as they should be ramping up for a playoff surge. If they can’t snap out of their daze soon, their first-round opponents will size them up and promptly knock them out.